Home » China » India » Indian Navy » Pakistan » Russia » UK » us » Submarines in the Bangladesh Navy : Acquired Deterrence or Strategic Misstep? 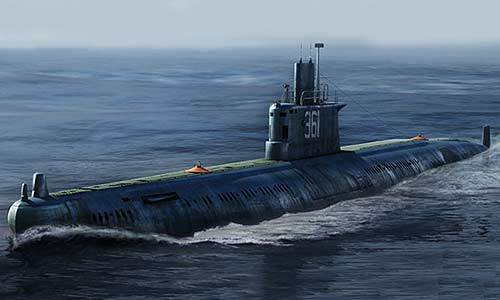 Submarines in the Bangladesh Navy : Acquired Deterrence or Strategic Misstep? On November 14, the Bangladesh Navy officially took delivery of two Type 035G diesel electric submarines (SSKs) in a ceremony held at Liaonan Shipyard in Dalian, China. These SSKs, refurbished Ming-class subs from the 1990s, represent the culmination of the Bangladesh Navy’s achievement of what Prime Minister Sheikh Hasina has called a “three-dimensional force” — air, surface, and subsurface combat capabilities capable of enforcing Bangladesh’s sovereignty in the Bay of Bengal. Achievement aside, this purchase poses a real danger to maritime security in the Bay of Bengal, and will stress already-tense geopolitical relationships in the Indo-Asia Pacific region. Bangladesh may have achieved some immediate measure of regional naval deterrence, but the long-term negative effects of this purchase will very likely outweigh the benefit. The strategic allure of possessing a submarine is not difficult to understand. A navy that can field a subsurface capability wields a powerful deterrent against any foe that might seek to deploy maritime forces against it. Even the dated Ming can be a lethal and stealthy asset in Bangladesh’s congested littorals in the Bay of Bengal. However, the Bangladesh Navy’s limited maintenance capability and low enlisted technical education almost certainly doom these submarines to pier-queen status. Perhaps the best way to achieve the strategic effect desired would be for Bangladesh Navy to construct covered submarine pens, employing a sort of fleet-in-being strategy in which Bangladeshi submarines in the Bay of Bengal are always possible, but not necessarily confirmed or observed. While $203 million dollars for two submarines may not sound significant in comparison with the nearly $500 million spent on one U.S. Navy Littoral Combat Ship, it is money that could and should be spent elsewhere by the Bangladesh Navy (BN). With several surface platforms built before many of its most senior officers were born, the BN would have benefited considerably from investing this money in capable modern surface combatants more suited for the limited national defense role and constabulary functions required of it. This purchase seems to be following the trend in difficult-to-justify submarine aspirations across South and Southeast Asia, and for a navy unprepared for the long-term logistical burden attached to that purchase, it can have disastrous consequences on naval readiness. One need look no further than Indonesia to witness the repercussions suffered by a navy that made the submarine leap without adequate training and maintenance capabilities to sustain them. During the Cold War, the Indonesian Navy maintained one of the largest submarine squadrons in Asia, 12 Whiskey-class vessels obtained from the Soviet Union. When the relationship between the USSR and Indonesia soured, Indonesia lacked the ability to maintain the boats alone. Thus, the vessels were slowly cannibalized for spare parts to keep a steadily-diminishing number of boats at sea, their numbers steadily dropping until the force evaporated completely. The 12 Whiskey subs were replaced by two Type 209 Cakra-class vessels from West Germany in 1981, which suffered a similar fate. The newly accepted submarines, renamed BNS Nabajatra, and Joyjatra, may be intended more as training platforms, preparing the Bangladesh Navy for the eventual acquisition of more modern platforms. However, even if the People’s Liberation Army Navy (PLAN) sends crews to Bangladesh to support the training process, the supposed Bangladesh Navy base at Kutubdia almost certainly lacks the support capacity needed to provide regular maintenance, and their submarines’ operational value will depend wholly on the good graces of the PLAN. In 2012 and 2014, UN Convention on the Law of the Sea (UNCLOS) tribunals handed down rulings on maritime boundaries that stood as points of friction between Bangladesh and its neighbors, Myanmar and India. The rulings affirmed Bangladesh’s claims to over 111,000 square kilometers of sea, as well as contested areas of the continental shelf. Had the disputes not been settled in a legal forum, Bangladesh would have had no reasonable expectation of contesting India’s claims at sea, and might have even struggled against the constabulary navy of Myanmar. Even with the awarded maritime area, Bangladesh’s access to the high seas does depend largely on its good relations with its neighbors, and its geography makes it highly vulnerable to blockade from the sea, as was evidenced in the 1971 war against Pakistan. Prime Minister Hasina’s 2016 call to “believe in the spirit of the Liberation War” could be equal parts patriotic exhortation and call to establish a developed naval deterrent force to protect its waters and rapidly expanding maritime trade. Given the peaceful resolution of the previously existing maritime disputes, the Ming acquisition may have been made simply out of desire for an improved navy to support Bangladesh’s burgeoning maritime trade. It is unclear what, if any, perceived threat might be prompting the Bangladesh Navy’s push for submarine capability. Given the overwhelming relative strength of the Indian Navy, it would seem that if these submarines were a strategic signal to a regional navy, it would have to be Myanmar, which has also obtained its more modern naval platforms from China and has previously alarmed Bangladesh with large military build-ups along their shared border. Alternatively, the purchase may have been pushed from the Chinese side, given PLAN interest in increased engagement in Bangladesh and the Indian Ocean writ large. The Ming acquisition is by no means the first time the BN has purchased an aging Chinese naval platform. In fact, China has provided nearly 78 percent of Bangladesh’s defense purchases since 2004. However, as several regional states (particularly India) are warily evaluating their relationships with China, Bangladesh has just upgraded its relationship with China to a strategic partnership. While India and others have succeeded in blocking many Chinese attempts at getting involved in development of critical deep-water port infrastructure in Bangladesh, China has succeeded in drawing Bangladesh into its so-called “string of pearls” via its bargain-priced defense sales. Even without the upgraded relationship, the new submarines ensure that Bangladesh will be bound to China for the service life of the vessels, as the PLAN will almost certainly be providing the majority of training and maintenance support. The deepening partnership between the PRC and Bangladesh will certainly complicate the relationship between India and Bangladesh, as well as India and China. The very obvious rise in Chinese naval activity in Pakistan, Sri Lanka, Djibouti, and increasingly Bangladesh, is contributing directly to a sense of encirclement in India which may have unintended inflammatory effect on Sino-Indian affairs. In the near term, the Bangladesh Navy’s investment in submarines seems ill-advised, with the potential for catastrophe. With a fleet full of aging platforms and a limited, though increased, budget, a few poor choices could have a crippling effect on its combat capability in coming years. Additionally, introduction of a newly established subsurface capability in a congested maritime shipping lane creates new opportunities for dangerous incidents at sea. While the Bangladesh Navy itself may have a limited reach, the acquisition choices it has made will also have far-reaching consequences. As China’s operational reach extends into the Indian Ocean, partners such as Bangladesh will be of crucial importance to the PLAN, and of great concern to India. The Sino-Bangladesh submarine deal is but one indicator of a delicate balance of power which seems to be shifting in the PRC’s direction.